If at all there is one credit card that suits best for beginners, that must be Amazon Pay Credit Card by ICICI Bank. While I don’t really plan to use the card much, I got it primarily to experience the application process and of-course to add new plastic to my collection. One fine day, when I opened the Amazon home page, a banner showed up, asking me to apply for the Amazon pay Credit Card. I also opened the application page link on Amazon app and I was now able to see the Apply Now option being enabled there as well. It was a 4 page process & it hardly took 1 minute to Apply. The Virtual card was made available for instant use. Amazon App & Net Banking also shows the new card in realtime. The Physical Card received just in 2 DAYS. This is the fastest I’ve ever seen. The design was Good enough for a Free card. The sweetest part is, there is no CIBIL enquiry. Its amazing to see how ICICI did the integration with Amazon to make this entire process super fast and simple. I wish every other credit card company does the application process as simple as this. Here are some of the images through the application process. I initially thought I cracked the code, because I got this invite just after spending over Rs.50K in the month. But then I came to know that many others too got the offer the same day, so that “may not” be the eligibility. That aside, I did few things when this credit card was initially launched. Like, I made test payments using all my ICICI credit/debit cards to see if that triggers the eligibility. So, somehow I was added to their system during their Financial Year End push. I’m sure most of you might be eligible for the Amazon Pay Credit Card by now. If not, you may try things that i did above. So, basically I got paid Rs.300 for getting this free card, just like the Amex MRCC and Amex Plat Travel offers wherein you can get paid ~Rs.3000 for applying, for free! Are you invited to apply Amazon pay Credit Card? Feel free to share your experiences in the comments below. I got my card today as well..
My application got rejected for this card, I have high purchase history and good relationship with icici saving account and credit card. Eligibility criteria is a mistery. Will reapply and month and see! I think this is something to do with your Amazon spends and nothing to do with ICICI relationship. I don’t think the eligibility criteria has got anything to do with Amazon spends. I have been spending a few thousands on Amazon every month since the last 2 years or so for my monthly groceries and daily use household products. Still when I applied for this card about 3 months back, my application was rejected. I also have a relationship with ICICI (savings account) for more than 10 years now. But I did not have an existing ICICI credit card at the time of applying for ICICI Amazon Pay card. I think the eligibility is linked to having an exisiting ICICI credit card. I see from your application process, you were asked for your existing ICICI credit card number. You have also mentioned that your card limit was shared with your other ICICI Credit Cards (Jet Sapphiro Amex & Visa). From the above 2 points (asking for existing ICICI credit card number and sharing limit with existing ICICI credit card), I am guessing that the eligibility criteria is linked to having an existing ICICI credit card. The other factors like existing relationship with Amazon (purchasing regularly every month from Amazon) and existing relationship with ICICI Bank (having ICICI savings bank account) did not help me in getting the ICICI Amazon Pay credit card. As I mentioned earlier, my application got rejected about 3 months back. I have a lot spending (for my friends and family also) in my amazon account. Congrats for another card. I also got approved and also got Rs. 200 in Amazon pay. Like you I was unaware of this offer. Feeling happy. One question are you sure that your new card’s limit is shared ? Mine shows separate. Thanks! Yes, this is 100% shared. ICICI also shares lower % at times. I think they made this update recently as many who got this card earlier got very low shared limit. Are you sure the limit is shared? It has the same limit as other ICICI cards but not shared. This is more like an add-on card. They’ve single aggregate limit & it is shared! That’s how ICICI works. But their app/netbanking will confuse you. Exactly. Their Netbanking /App did confuse me and continues to confuse me when land on the credit card tab every now and then. It’s indeed single, shared limit. Limit Is not shared Siddarth. The reason for this is..i had 2 cards earlier with shared limit. My Amazon card showed the same limit.. But after usage of older cards the available limit changed for them but this remained constant. I rechecked it by using this card, now older cards show diffente available limit in comparison to the limit available on this card. There is nothing to do with your Amazon spends at all, I have applied thru my freind’s amazon account which has got invited without any single purchase in life span of that Amazon account. We can take over that Amazon account by changing mobile number and email id in Amazon account. I got paid Rs750😀. Yes the limit is shared with your other icici card. This card will make lots of sense once smartbuy 5x also goes for us, till then its good for beginners. Rs.750 is nice. But how? I got Rs 2,000/- as recent as March 5, 2019 ! I use this card for all my Amazon purchases and wherever I can use Pay balance as wallet like in MMT. This gives cool rewards in pay balance every month. “They are independent of each other and I am damn sure about it” – How do you say that? As per my knowledge, it’s shared limit. If you do transaction on any of the card it’ll be reduced from 3L, even though in Netbanking it’s shown as 3L for both cards in remaining/unused limit. ICICI does show like that but the actual account number behind the credit card and it’s limit will be the same. Yes! Can confirm this, The limits shown on the Platform is glitchy! I received the card couple day back. I guess they approve as long as we have a existing icici credit card. The total credit limit is the same old limit, I too got confused. Well, I believe the new amazon CC is not sharing the limit with my existing card atleast for me. My CIBIL , Crif Reports shows 3 ICICI CC ac , the new amazon CC has a recent open date. The balance on ac is also reported accordingly. Also I see ICICI paylater is being reported as Credit Card though the credit limit of 10k limit is not reported. I think this card is not being offered to to the people who got their ICICI credit card against Fd. I have a Coral icici CC against fd from almost 6 months with 5l limit and I do not have the offer even have over 150 orders from amazon from past 6 months. Considering doing full KYC soon. I got this card in Jan 2019. Recently when i called Customer Care no. mentioned on back of the card, i was told that this card is independent of earlier icici card i.e. i can close my existing card n continue having Amazon Pay card. Can anyone confirm that ? @Sid whats your take ? My Amazon pay card has same limit as existing card but when I made purchase from Amazon card …it didn’t reduce my limit on other cards….hence I think limit is not shared. One more interesting thing…. ICICI pay later account is being reported to CIBIL as credit card..now my CIBIL will improve even faster. If you already have an ICICI bank credit card just note this. 1. 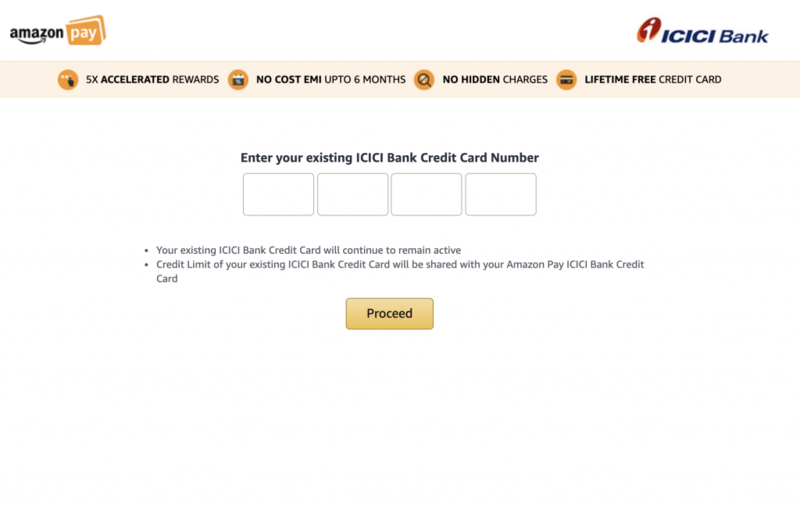 The credit limit of Amazon Pay ICICI bank credit card is not shared with your old ICICI bank credit card. These credit limits are independent. 2. The statement and payment due dates may be different for both ICICI credit cards . I discovered it just in time because of Walnut app reminder else I would have missed it. So be careful while managing multiple ICICI bank credit cards. You have to make two payments / give two standing instructions, one for each card. I also got this card, and offer of 750/- . I recieved this card way back in early December 2018 as part of the first beta users for this program. Initially I was surprised to see Amazon entering the payments segment. My experience of spends around 1L+ so far, the rewards are really good (credited as Amazon Pay balance only) and because they give 5X/3X rewards for the website, Amazon is ensuring your stickyness towards the company. Not sure about the shared credit limit part – I got my card generated today with a credit limit of 30,000. I do not hold any other ICICI credit card. I personally hate ICICI. Their apps/shared limit is too confusing. I had Jet Rubyx, discontinued and went with ICICI MMT. Yet unable to link that as don’t have savings account. Whatever said and done, the revert and response from Amex/Citi etc is definitely amazing and makes you continue to use those cards. I am not sure about using this card TBH. I mean I get it 5% is great but more often, there are Amazon offers on other banks. Hence would rather use my diners premium/Scb ultimate over this. Your thoughts? P.S- even got SCB ultimate so easily but that DCB :3 that’s out of my reach always. Even upgrade from YFP unable to get. I also got approval for this card. Good card for amazon spends. More beneficial during sale time. This card beats the cashback option of citi cashback card on outside spends . @Sid- Thanks again for your wonderful updates. waiting for your article on best cards for 2019 . I have this RBL Bajaj Finserv Platinum card and it has no significant benefits. Worth noting are 250 off 1500+ bill on Grofers every Monday n Friday. Nothing much apart from this. Reward rate is paltry too. Thanks Satish. I would rather close it. Also can you suggest whether now the ICICI jetairways rubyx is really worth holding looking at the ongoing Jet crisis and also I don’t see any Jet flights since last month . I have an invite too for Amazon pay icici card but didn’t get any other icici card because of their bad reward system. Did any one get the card without holding credit card with icici? Is this card worth if we have diners club black since we get Rs 5 for 150 spent plus 10x if offer exist. The only reason this card is good is EMI but again we don’t get points for that. I got this card without ever having used ICICI Credit card in the past. Only other card I have has a limit of INR 56,000 (HSBC Visa Platinum, Got it in 2015 when I started working). I never used CCs much after getting the HSBC card though. 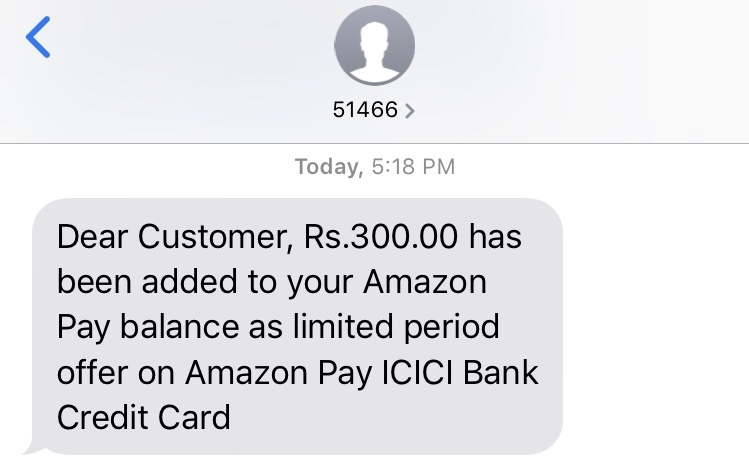 Everything changed when a friend of mine told me about the AmazonPay ICICI CC. So I checked my amazon and there it was, a LTF free card with a INR 750 joining bonus. I immediately applied through the simple application process. Instant e card generated with a limit of INR 1,30,000. I was delighted. This was mid January 2019. I keep traveling for work(Domestic Flights+Hotels+Food+Cabs) and all these cards certainly are useful. For e.g. My spends have already crossed 2,20,000 in the last two months.(Personal+Official). I am thinking I will close the Amex card as I want to play with citi premiermiles for now. Any other card that you guys suggest. A big change from a cash/debit spend focused person to utilizing credit optimally and reaping the benefits out of the CC rewards. Still learning to maximize my gains. man your AMEX platinum charge card review.!! still eagerly waiting for it. send an invite, once its available. It is giving this error for any pincode. whats the solution???? I got invitation for this card recently. The credit limit is shared with the existing credit limit. The virtual card was created immediately and the physical card was delivered within a week. The card design was pathetic. Rs.300/- Amazon pay balance was added. I think the invitation for this card is not linked with the spends of Amazon but, it’s directly linked with the existing credit card. My Jet sapphiro credit card is 3 months old and my spends are good. I feel that it doesn’t make much sense to have the Jet sapphiro at this juncture as the jet is in deep waters. I don’t find a single flight from Hyderabad to any of the destinations of the country in the coming 2/3 months. Can we hold this card by cancelling the existing Jet sapphiro Card?. Yes. You can cancel your jet sapphiro and still hold this card. As per my experience AMAZON checking eligibility by taking your registered mobile number in AMAZON account and comparing same with ICICI customer database. If it matches then they get to know you have an existing credit card relationship with ICICI. I had done purchase more than 5-6 Lakh in last few years at AMAZON , having a ICICI card and savings account but I was not getting APPLY button for this card at AMAZON. Then I analyze how others are getting invite why not me. I found AMAZON registered mobile number was other that which I have with ICICI. I changed mobile number in AMAZON to the one which I have in ICICI……after 2 days APPLY button enabled !! Thank you! I hope that is indeed the trigger everyone has been searching for. I have the same mobile number however my email ID in ICICI credit card account and Amazon are different. However, I have just received Rubyx credit card 2 weeks back. I hope it gets triggered despite different email IDs. 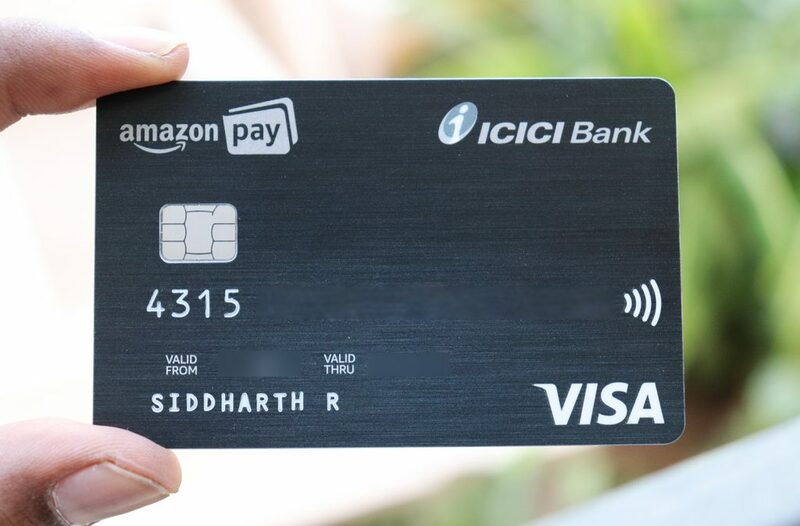 Mine amazon pay card invite came after 3 months of holding an ICICI credit card. So if your mobile no. in amazon account and existing ICICI card account is same, I think this may be the expected minimum time line to get the invite. 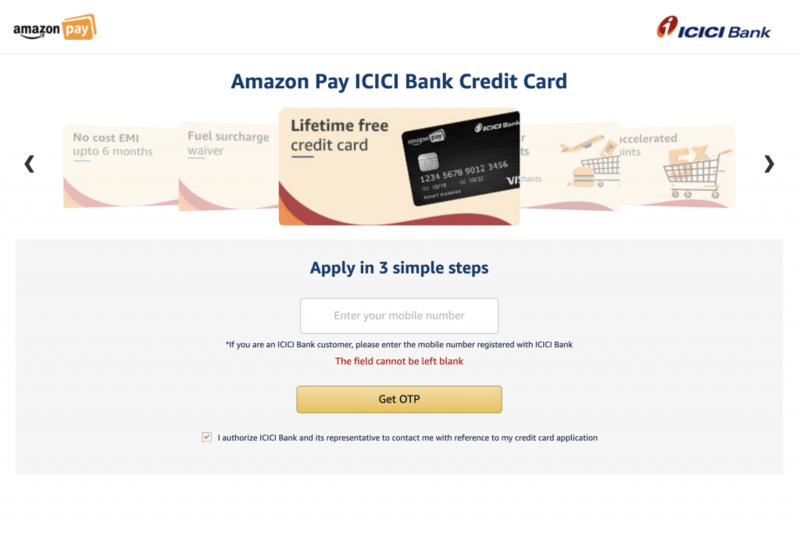 Better still, use your existing ICICI credit card for 1-2 transactions at amazon. This may trigger the invite faster. I don’t think it matters. I had different mobile numbers and same email id. Still got the invite. I don’t think so. It might have happened in your case. But, in reality, it’s not like that. I strongly believe that there is a direct connection with the existing credit card. I spent a lot in Amazon. But, after the vintage of my ICICI card was more than 3 months, then it’s triggered. As per the t&c of the Amazon Pay card, it’s clearly mentioned that we’re not going to get any rewards/Amazon pay balance for EMI/ NO COST EMI too. ICICI slashing MAB charges inspite of having WEALTH MANAGEMENT status. When I approached them regarding this, they are clueless. There is no use with the Jet sapphiro right now. It’s better to discard the card. I spoke to Amazon customer care and they say we get reward points or Amazon pay balance 5x even for EMI. I am confused now since some comments say we don’t get. Can any user confirm why Amazon has reason to lie? Bcoz its clearly written in tnc of the card. What you have been told is verbal reply which can’t be relied upon. Specially if you are making big transactions on EMI and later denied points on it as per tncs, you can do little and hence missed opportunity. Better take this in writing from amazon cc if they are sure about it, which I bet they won’t give. If they do then we all cardholders (of amazon pay ICICI card) have a reason to say “CHEERS”. Equated Monthly Installment (EMI) transactions and Gold-Purchases made on Amazon.in using the Card will not be eligible for any rewards. This is interesting. What do you think triggered this? Have you been using your card regularly? I used this card only on Amazon pay… Only for ordering food via swiggy and to purchase sparingly on Amazon. The card is just 3 months old though… My 10 month old sapphire didn’t get any enhancement, but I have not used d card often. I have it in written chat might be a mistake by customer care coz I again read T&C and it says no points for EMI, Amazon pay top up and reload. This card becomes useless other than EMI throughout the year and LTF card no major advantage. I tried to purchase an AC through amazon. There is an offer running of Rs 1500 instant discount of on icici card. I thought of using icici amazon pay card. At card entry page it shows the discount available of 1500 but on the final confirmation it removed this discount and shows that discount is just 5x of amazon pay. So it look likes double dip is not possible. The card does not provide over and above any promotions run by ICICI card. If I changed to EMI payment, I was getting Rs 1500 off, but in that case 5x rewards points are not valid. So it liked you are just restricted to get 5X reward only and cannot combine with other icici offers. I used this card during super value day recently and have already recd. 15% cashback as amazon pay balance. 5X reward points as amazon pay balance will come after card statement generation only. So I can say that double dip is also possible maybe not always. Thanks for the info and that’s bad move by icici for not giving additional 1500 off. With hdfc I can get 10x+10%disocunt +if any cash back offer by Amazon pay and I can repeat the same with debit card too during the same Amazon sale period. What about bill payments like broadband? Do we get 2x points. Also can we avail 2x points +100 off with BMS? But compared to other icici cards I feel this is better than payback points. Would you recommend to take this card? I only wish there were points with EMI too. i was eligible to apply this card 3 days back, but my current coral card number shown invalid when i entered it. i tried 3 times its blocked now. I already sent mail to icici customer care, but no response as usual. Can anyone please confirm if I opt for EMI from the merchant (paytmmall), will I be getting reward points for that? Also please confirm if this card falls under the category of corporate or commercial cards. Thank you. I had read this post on this site and got inspired to apply from the link. Logged in and found the apply now option which was not coming before. But I had a different application experience. First off, I had connected my icici account to Amazon upi and that’s the reason I think I got the invite. Further unlike others, it said my pre approved limit is 3.3L and it dint ask me for icici credit card number. Seems strange. I also have a coral credit card with 1.5L limit but never used it on Amazon yet. I didn’t get a card number generated instantly. Went through normal application process and a guy verified my ID and address proof. Not sure if I’ll have a Cibil check too. Anyone had this kinda experience when applying? 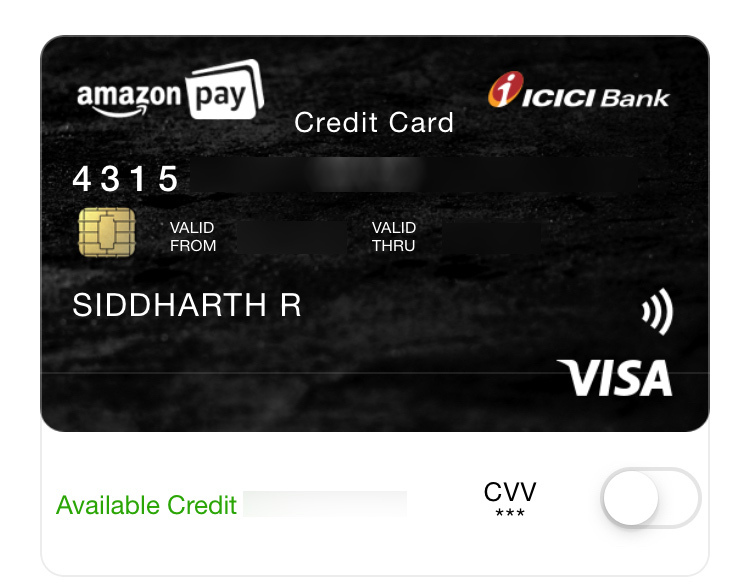 I had a chat with Amazon customer care and they said it’s not necessary to have icici credit card in order to apply for amazon pay credit card so might be now they have updated the site ui . Bank might be just cross checking with your relationship with the bank and give the card accordingly. I read the T&C again and it clearly states that 5x is in addition to any other normal offers which means we will have to get both. Also no points for EMI transactions. I was resisting this til yesterday. They have upped the offer by 200rs. i.e., 500 amazon cash for prime members if applied and I did. Waiting for this card. Got 2.5L limit. This will be my backup card in case indusind iconia amex is not accepted, as i get 1% cashback. This will for sure save a huge amount if used for buying appliances on amazon. Yes, that’s right, I got a higher limit probably because I hold a icic privilege banking account. The card is auto linked to the netbanking user ID. Now I am interested to know if anyone got visa signature or better versions. There are specific offers running for visa signature and infinite so it would be great if this card offers them too based on the approved credit limit. Because hdfc credit card guys said if the limit is above 3L, then it is mostly a visa signature card and normal visa can’t have more than 3L limit. Is it true? 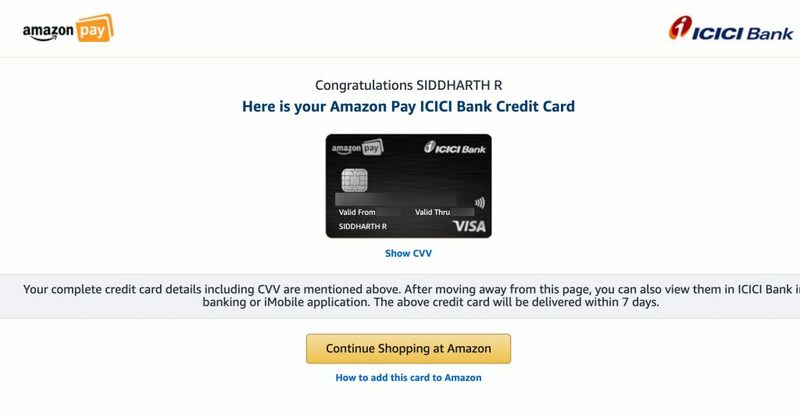 i also applied and got amazon pay icici card. I am big fan of your posts here..Now coming to this Amazon pay card..I have got the invite in 17 Jan 2019 and I applied and also got 750 as promo offer ..
Are you sure there is no CIBIL inquiry for this card? My application was approved and card got generated with CVV. But amazon pay balance is not updated. My amazon pay is not KYC updated. As per the FAQ, KYC is not required if you are an existing ICICI bank customer.